Tom Tranberg is a paramedic and another Connecticut resident who proves that "nessesity is the mother of invention" and "perserverance is its father". Back in the year 2000, Tom was making his legendary tuna melt sandwiches for his family. One of his secrets is to drain the tuna as completely as possible. As he was squeezing the last drops of juice from the tuna cans, he once again found the juice dripping off his fingers and hands. As always it was a smelly mess. His fingers hurt from squeezing the cans but this time he was lucky for he hadn't sliced his thumb on the sharp edges of the lids. He found himself saying there has got to be a better way. The next week he asked his wife to see if she could find something at the store that would make this process easier. She couldn't find anything and told him he would have to invent something, Tom put his logical mind to work. As a paramedic Tom was always trying to formulate and implement solutions everyday. 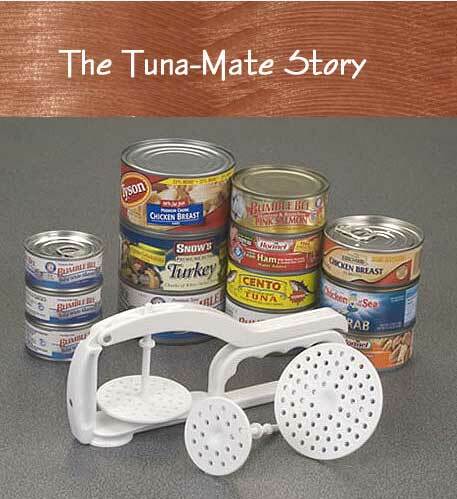 He proceeded to design and develop what today has become Tuna-Matea simple, easy way to press and drain tuna, turkey, chicken, shrimp and clam cans without the hassle or mess. Sadly Tina passed away from a sudden illness in 2005 but Tom persevered to make Tuna-Mate a reality. Today Tom personally oversees the manufacture of Tuna-Mate and takes great pleasure in knowing that gourmet cooks, foodies, and moms, dads and kids are enjoying the simple benefits of Tuna-Mate.